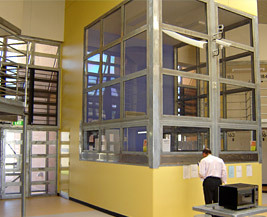 Lietzke high security steel windows and barriers are widely used and specified by correctional institutions for high security prison applications. 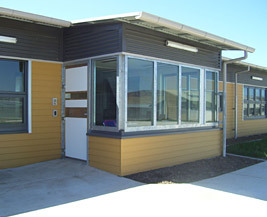 Lietzke high security windows and barriers are custom designed and manufactured to meet the specific requirements of the customer. The unique combination of pre-fabricated structural steel and custom folded sections ensure our windows and barriers not only survive, but excel in the toughest of tough conditions. The high security Lietzke windows and barriers include a range of attack resistant Lexan and glass options and can be custom engineered to include options such as pass through hatches. Barriers and windows can be specially designed with T-bars and reinforcing rod so as to be cast in to pre-cast concrete walling or they can be post fixed and blocked in. The frame material can range up to 3 mm Galvabond steel. Preparation in doors and frames can be made for all secure locks and hardware to reduce installation time and costs. Application requiring the highest of physical protection including cell doors, general prison doors, detention centres, mental health units, youth training facilities, law courts and police stations. A range of various finishes are available including prime painted metal clad and galvanised. Various combinations of fabricated structural steel and folded steel sheet metal. All high security locks can be including mortice locks, surface mount, surface rebated, door frame mounted and even electric locks can be made provisions for. Contact Lietzke and talk with our sales engineers who will assist with any specification enquiries.